Thunder Bay seems to have a pretty stable economy over time. In fact in the years I have lived here, beginning with attending Lakehead University in 1974, you really sense the stability. There have been some ups and downs, especially with the forestry industry, but for the most part we keep moving along with small growth. I was wondering why we remain so level in our economic activity and you get a hint of why when you realize almost all of our top employers are government or primarily government funded. In fact according to Thunder Bay CEDC stats only Bombardier crack the top 9 list of employers and they rank 8th. In many respects it is ok to have such as government focus on our jobs here in Thunder Bay. They tend to pay well, have great benefits and working conditions for their staff and can withstand the ups and downs of the economy. Sometimes the private sector can expereince more difficulty keeping their staff levels up when the economy is weak. So the 15,000 plus government sector jobs we have in Thunder Bay go along way in smoothing the ups and downs in our economy. 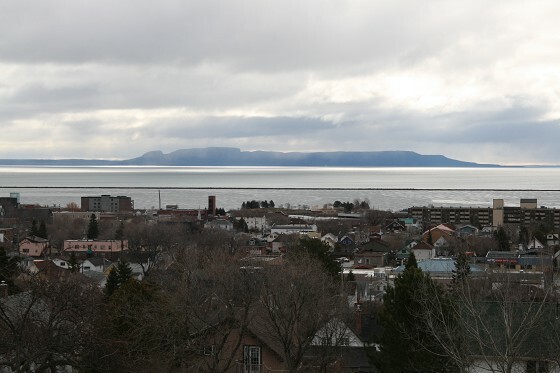 There are some signs that we may be on the cusp of an economic boom in Thunder Bay. When you look at housing costs here, including resale pricing, you can’t not be amazed at current pricing. New housing such as a bungalow in a nice subdivision can be around $500,000 which is the highest ever I think. The demand for housing is great and that must be for a reason. Even apartment rental rates are high and in short supply. I asked one building manager about rental rates,where I used to live long ago while attending university here, and she told me a 2 bedroom rents for $1200 to $1500 per month and they have a 2 year waiting list! What will affect our economy in the years to come? I think Thunder Bay is becoming more and more of a regional hub for Northwestern Ontario. We have great retail shopping opportunities. There is excellent health care available with many specialized services here. Educational opportunities are excellent with a full range of training from medical doctors, engineers, technicians, trades skills- the list is endless. Perhaps that is why the health care and educational sectors are such large employers. I think the business sector of Thunder Bay is and will always remain the most prominent factor in the economy. It may have a different look with fewer large scale operations with hundreds of employees but many smaller entrepreneurs that can be in the 1 to 10 employee level. In fact I know Thunder Bay Business is mailed out to almost 4000 businesses so we have a large and vibrant small business sector here. On the horizon for us all is the Ring of Fire mining opportunities. We are seeing the build up to it right now. Many large operations are gearing up to participate and once this complex project starts off with some needed components like access roads, electricity and environmental approvals we will see great economic activity here in Thunder Bay and Northwestern Ontario. In general I like what I see in 2014 in Thunder Bay. If we all have a little patience things will only get better!